Watch Youtube US videos – How to unblock 2012 Youtube movies with a VPN service? Google just announced it’s adding more movies on Youtube movie rental service. The company stuck a deal for the upload of 500 Paramount‘s studio movies to Youtube and Google Play, after bringing about 600 movies from MGM. ten other independant studios, the Youtube catalog is being competitive in front of sites as Netflix or Hulu. Nevertheless all videos are only available in the U.S. and in Canada. Actually Google only purchased the broadcasting rights for both countries. Aside from Youtube’s censorship and the availability of its traditional videos which can be restricted in accordance of your country location, this new offer is also limited. As an example if you try to access to geo-blocked content, you will automatically be faced to the message on the side. How to access to Youtube geo-blocked content? 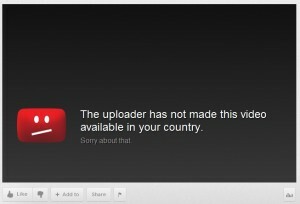 Youtube’s blocked content is mostly reachable from the USA. So you have to appear as an American to bypass the restriction. The Virtual Private Network (VPN) is an user-friendly application which enables you to connect to VPN servers according to their location. Once the connection is established you benefit from a new IP, which is provided by the server. In order to access to Paramount and MGM’s contents on Youtube and Google Play choose a provider with US VPN server. Moreover the VPN is also good way to manage your online privacy. Its connection process includes your data encryption through VPN protocol. Nobody can be able to determine your identity or to catch your informations. Thus you can for example manage your privacy on Google, or secure your devices like the iPhone, Blackberry or Android.